The Leica CL is a new compact system camera, which fits in the same line-up as the Leica TL2, which was announced in the summer of 2017. It uses the same lens mount as the TL2, which also accepts lenses from the SL range. The components of the CL are very similar to those found in the TL2. For example, it has the same 24 megapixel APS-C sized sensor, along with a Maestro II image processor. Where the CL differs mostly from the TL2 is in its body design. 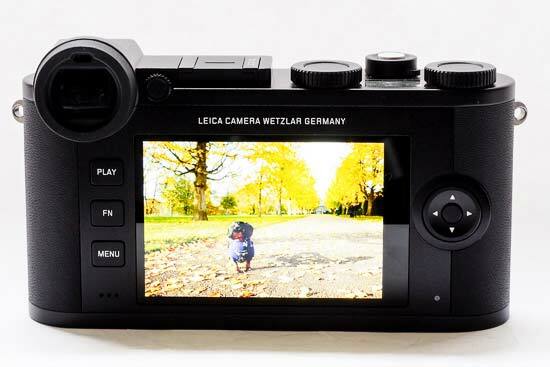 While the older camera uses an entirely touchscreen interface, with all image composition taking place via the screen, the CL has a smaller screen but an integrated viewfinder, plus the addition of some buttons which you can use to set key parameters. With the introduction of the new 18mm f/2.8 pancake lens, there are 7 compatible TL lenses, plus 7 SL lenses, and a further 49 M lenses and 64 4 Lenses, which can be used with the CL with an adapter. 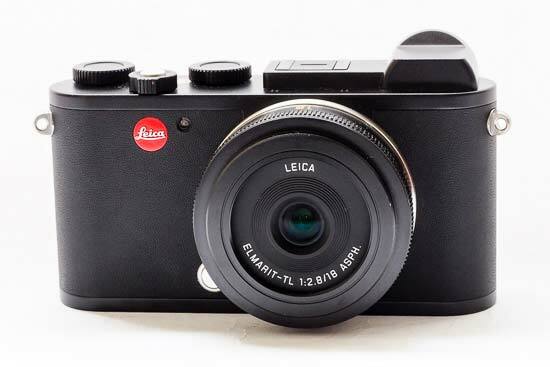 At the time of writing, the Leica CL price is set to be £2250 body only, or £3150 with the 18mm lens (prime kit), or £3275 with an 18-55mm Vario Kit lens. The Leica CL has a classic rangefinder style shape, with the added bonus of not being as complicated to use as something like the Leica M10. The main reason for this is that it has autofocus, coupled with an easy-to-use viewfinder. The advantage of the viewfinder being on the left in the same style as a rangefinder however means that you can keep your other eye on the scene unfolding in front of you, making it ideal for street photography, or indeed anything where the scene may change while you’re taking the photo (this only applies if you’re a right eye shooter, though). 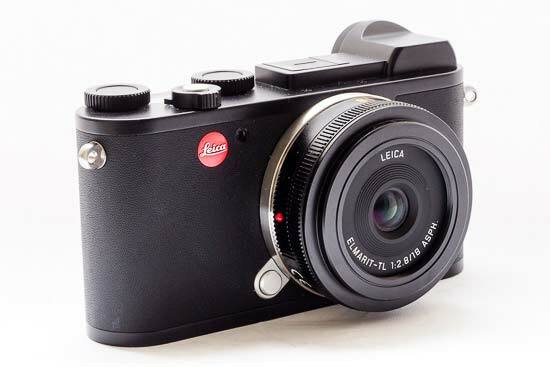 Similar in size to the Leica X2 compact when used in partnership with the 18mm pancake lens, the Leica CL makes for a great walk around camera, being light and compact. Despite this, it feels well built and has the high-quality construction that you associate with Leica branded cameras - the CL is made in the German factory. Looking at the CL from above, you’ll see the dials and buttons you’ll need to control the most fundamental aspects of the of the camera’s operation. There’s the shutter release button, but also two dials which feature buttons in their centre. Press these buttons to jog between different settings, including aperture, shutter speed, ISO and exposure compensation. The buttons will have default options, depending on the shooting mode you’re in - but you can also customise the dials and buttons to control different settings if you prefer. If you hold down the right hand button for a couple of seconds, other options which you can change will also appear. Also on the top of the camera is a small LCD screen which shows you the key settings you have selected. It shows aperture and shutter speed, which is a great feature for discreet shooting situations - you can make sure the camera is set to however you want to shoot before moving it anywhere near your eye ready to shoot. A clever function of this screen is that automatically illuminates if the camera senses that it is dark - you can switch off this function if you want to though, if you need to remain discreet in darker conditions. 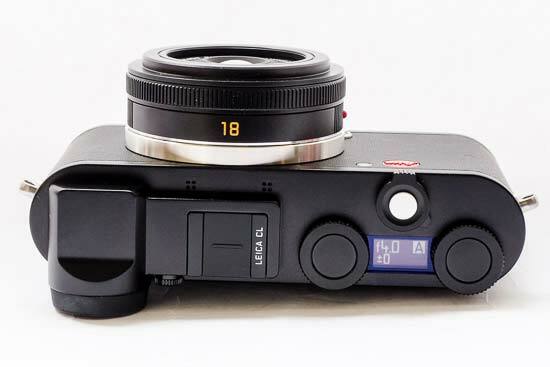 A hotshoe is found on the top of the Leica CL, via which you could add optional accessories, such as a flash - there isn’t one inbuilt into the CL. As already mentioned, the viewfinder of the CL is found on the left hand side of the camera body. This means there’s a bump on the top plate to accommodate it. There’s an eye sensor on the viewfinder, meaning it will automatically turn on when you lift the camera to your eye, and off again when you take it away. There’s a dioptre adjuster next to the viewfinder - a nice touch is that you need to pull it out away from the camera body before you can adjust it, then push it in to lock it into place. This prevents accidental unwanted changes, for example when the camera is in your bag. Moving to the back of the CL - there are three buttons along the left hand side of the screen, with a navigation pad found to the right. This is a change from the all-screen back of the TL2, but is still few enough not to overwhelm. The three buttons are a Play button, for seeing your images in playback, a customisable Function button (Fn) which can be set to change whichever setting you feel is most necessary, and the Menu button. When you press the menu button, you’ll see that you’re presented with a “Favourites” menu - this is a bit like a quick menu, only featuring the most common settings. You can add or remove settings to these favourites, again ensuring that you use the CL however you feel is best. At the bottom of the favourites menu, you’ll see that you can access the main menu - it’s here you’ll find more extensive settings, including the ability to customise your settings. You can use the navigation pad for a number of different things, including scrolling through your images in playback, and setting the autofocus point. In playback, you can use the scrolling dials on the top of the camera to zoom in to check critical focus. 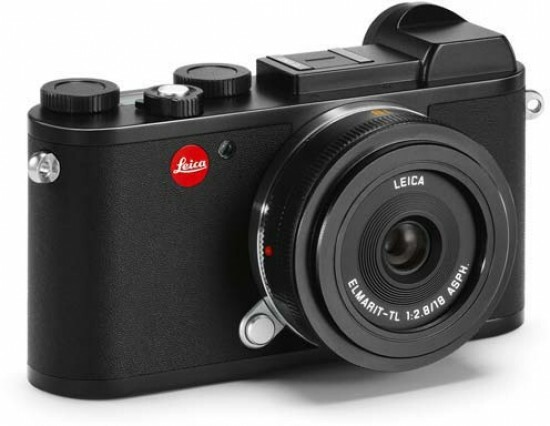 The Leica CL has both a mechanical and electronic shutter. By activating the electronic shutter, you can shoot completely silently which is useful for discreet situations. It also facilitates a fast shutter speed of 1/25000, as compared to the 1/8000 available with the mechanical shutter - this is very useful if you want to shoot at wide apertures in bright sunlight. It’s worth remembering that you’ll need to reactivate the mechanical shutter if you want to use long shutter speeds. Although not primarily controlled by touch, the CL never-the-less has a touch-sensitive screen. You can use it to set the autofocus point, but there’s a slightly annoying problem here. In order to use it for this purpose, you need to set the AF mode in the menu to “Touch AF”, or “Touch AF + Release” - the latter means that the shutter will be fired once focus is achieved. Once you’ve done that, you won’t be able to use the buttons to set the autofocus point, meaning if you lift the camera to your eye, you won’t be able to change the AF point unless you take it away from your eye again. So, basically, you can either use the touchscreen, but sacrifice being able to change AF point with the viewfinder, or, you use the buttons and not be able to use the touchscreen to set AF at all. It would be nice if you could use either the screen or the buttons at all times - perhaps this small niggle could be fixed with a firmware upgrade though. There’s just one door on the bottom of the CL, which hides the battery and memory card slots. The CL accepts SD cards, and is compatible with the faster UHS-II cards. 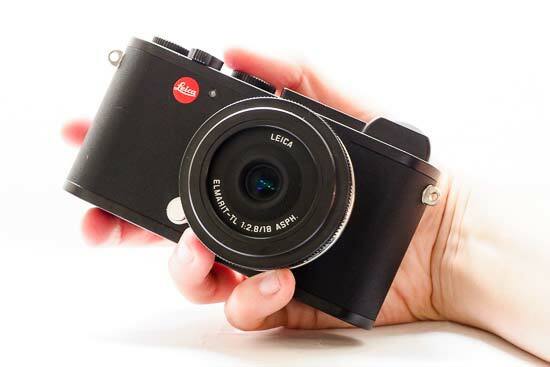 The Leica CL has inbuilt Wi-Fi for remotely controlling the camera, and transferring shots across to a smartphone. At the time of writing however, the app was not available so we weren’t able to put this to the test. We’ve had success with using Leica’s apps before, with cameras such as the Q, so we have every confidence that it will work well.